run on Animal Man for the first time! a writer named Grant Morrison. 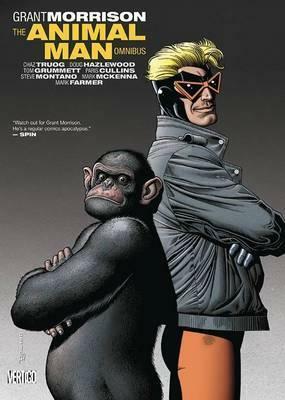 Collects Animal Man #1-26 and Secret Origins #39. "[Grant Morrison is] comics's high shaman." "Washington Post"
"[Grant Morrison is] comics's high shaman." --"Washington Post"
Grant Morrison has been working with DC Comics for more than twenty years, beginning his American career with acclaimed runs on ANIMAL MAN, DOOM PATROL and the ARKHAM ASYLUM graphic novel. Since then, he has written such best-selling series as JLA, BATMAN and New X-Men, as well as his creator-owned titles such as THE INVISIBLES, SEAGUY, THE FILTH and WE3. He has been hard at work expanding the DC Universe in titles ranging from the Eisner-Award winning titles SEVEN SOLDIERS and ALL STAR SUPERMAN, to the weekly comic 52 to, most recently, the ground-breaking crossover FINAL CRISIS. In his secret identity, Morrison is a "counterculture" spokesperson, a musician, an award-winning playwright and a chaos magician. He lives and works between Los Angeles and his homes in Scotland.